Is the Living Wage Realistic? I recently found an interesting calculator (Via Lifehacker, via MIT), called the Living Wage Calculator. The smart folks over at MIT put it together to”provide a minimum estimate of the cost of living for low wage families.” Normally, when I see one of these calculators, I try it once, scoff lightly, then move on to something far more useful with my day. This calculator is a bit different from some other ones I’ve seen in that it actually gets pretty localized. Others tend to use a generalization like “urban” or “suburban” and leave it at that. The fault there is that the living wage in an urban setting like Los Angeles is going to be very different from a living wage in the urban setting of a city like Fargo. The MIT living wage calculator gets localized down to the county you live in, and then goes a bit further and can go right down to the city that you live in in some cases. I gave it a run based on my county, and then based on my city. Not surprisingly, I got the same number in both cases. The city I live in is both the county seat, and the largest city in the county. I suppose it’s possible that the numbers could vary a bit at the two levels, but I don’t think it would be too much in any case. A Living Wage: Example locations. To compare how the results fare based on your actual location, I ran it for a few different locales. First, using the example above, for Los Angeles city. In all cases, I used the 2 adult, 3 children number. For Los Angeles, the calculator returned an hourly wage of $27.97 which translates to just a hair under $58,200. (using $/hr * 2080) For Fargo, the calculator returned an hourly wage of $20.56 which translates to about $42,800 a year. To be honest, I was a little surprised by the small difference between the two. Not that almost $16,000 is a small amount, but considering the difference in the size of the two cities, I really expected the living wage to much more significantly different. For a second example, I compared Fargo against the city that I live in. The numbers for Fargo are above. For my city, the calculator returned an hourly wage of $19.20 which translates to about $40,000. This difference was a bit more expected. The two cities are only a couple of hours away, and their economic differences are pretty minimal. I also got curious and looked up what it would spit out for a living wage for New York City (Queens County). There, it estimates the living wage at $26.12 an hour, or about $54,300 a year. I found it somewhat interesting to dig into how they were calculating the living wage. They’ve estimated some of the expenses for an average family of a certain number of adults and possible children. Based on our own expenses, I think it’s safe to say that some of them are a little low. They’ve also assumed that any 2 adult family with children is a one-income family with no childcare expenses. In fact, I’m not so sure that they aren’t saying that a 2 adult household with no children would be a one-income family. Given all of that, it was a bit reassuring to know that our family makes more than what they’re assuming is a living wage for our area. However, that’s with two incomes. Which also means that we’re spending plenty of extra on child care. If I use their numbers for expenses for 2 children and childcare, then add it to their 2 adult, 2 children number the resulting number is not that far from what we’re really making. There’s still a bit left over above that amount, but it’s a bit of a reality check too. Time to find some ways to increase income! A Living Wage: Is it Realistic? All the playing around brings a question to mind. Is the living wage realistic? It’s important, I think, to realize that the living wage is meant as an indicator of the amount of income that is necessary to assure that a family can pay for the bare necessities of “living”. Keeping that in mine, it might be realistic. But, one of the key things I don’t see in the expenses categories is a line for any sort of debt servicing. Which means they’re assuming that you’re renting a house or apartment, and that you don’t have any other debts. And we all know how realistic that assumption is. Or not. I think, for this to be truly realistic, it’s got to assume that the family will be dual-income. It’s also got to assume that at least one of the two adults will have some student loan debt. More likely, both. And it’s got to assume that there’s going to be some other debts that will need servicing. Then it might border on a true living wage. Otherwise, it’s just another way of saying poverty line. Go and give the calculator a spin. How close to the number are you? Are you so far from it that it’s scoff worthy? Or is it time for you to find a way to increase your income too? 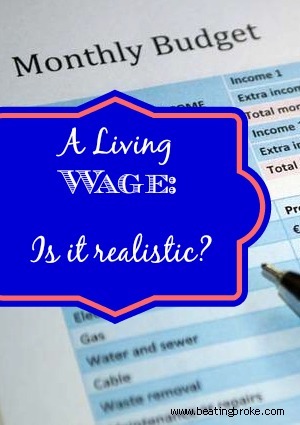 Do you think that the living wage is realistic? Jim over at Blueprint for Financial Prosperity asked us all what we thought of salary transparency. I don’t know about you, but there’s always something intriguing about my coworkers salaries. Are they making more than I am? Am I making more? How much do they take out for retirement? But alas, that is not for me to know. We have no salary transparency. And that’s probably a good thing. Salary transparency can remove many of the problems that people have by letting them know exactly where they stand. It can give people a clue as to how well they negotiated their salary and their last raise. It can lend a hint towards seniority. And it can expose any bits of favoritism. One of the best examples of salary transparency would be any jobs where the workers are union-ized. As part of their contract negotiations, all unions negotiate the pay of their members. As such, they generally end up with a very structured pay scale. Also, as such, you can usually know a persons salary within dollars of the actual salary. There is very little differentiation between the workers. Only through tenure (and strikes) can you income really rise. Unions have transparency because it’s in their contracts, and since those are pretty much public to the employees, the salary structure is fairly public. In any other case, it is my belief that salary transparency is bad. It may cut down on nosy people, but it could lead to a great deal of salary jealousy. Even if they all know why Bob is making more than they are. Despite all the normal arguments against salary transparency, the most compelling is that it isn’t my coworkers business what I make. If I successfully negotiated a better salary than the guy in the cubicle next to me, or got a better raise, that’s between me and my employer. If my employer thinks that I’m worth what I make, that’s my business. Plain and simple, my wage is exactly that. Mine. That thought is one of the reasons that I haven’t and have no plans to publish my salary here. It’s also the reason that I made the decision not to publish any detailed financial details such as a monthly balance sheet or net worth here. What are your thoughts on it? Let me and Jim know!